Please feel free to contact us if you have any problem. Trust us, we do care and we are always willing to solve your problem. Support any smartphones, tablets or other devices 6" - 13", such as 9.7 inch iPad mini 1 / 2 / 3 / 4, 10.5 inch iPad 1 / 2 / 3 / 4 / Air / Air 2, 12.9 inch iPad Pro, Samsung Galaxy Tab, Microsoft Surface Pro, Amazon Kindle Fire HD, etc. Aluminum metal martial cool your devices better. The Hole in the platform station increases airflow. Lightweight and folding design is compact. Warm prompt: For solid support, it may be a little hard to adjust the angle （Excellent stability）. 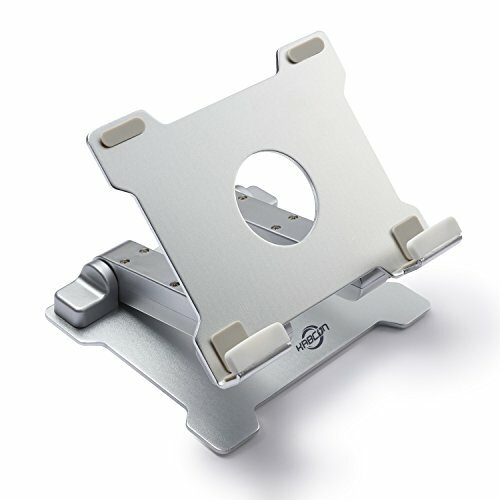 With anti-slip rubber feet, stabilising front edge prevents tablet from sliding off stand.